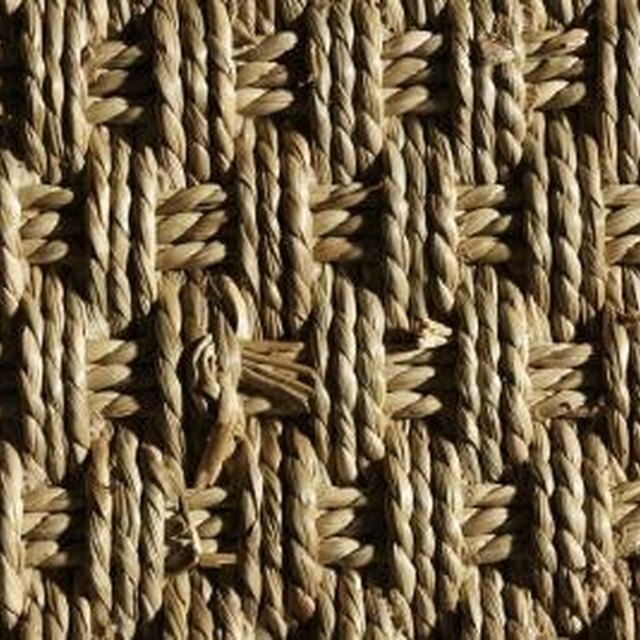 Rattan, also known as "French Cane" or "wicker," is made of reed and its practical use dates back to biblical times. It is still used to make a variety of objects such as baskets, screens, tables and chairs. Rattan chairs are durable, comfortable and suitable for indoor and outdoor use. If the rattan breaks, it can be replaced quite easily, with pre-woven rattan sheets available in craft or home improvement stores. Rattan chairs, stylish and comfortable. Place the card sheet on the rattan chair seat that requires repair, and cut the card around the outside of the seat frame with sharp scissors. Make sure you cut the shape larger than the seat by at least 2 inches, as the card is going to be used as a template when cutting the rattan sheet to size. Place both the cut rattan sheet and the rattan cane into a bowl of hot water, and leave to soak for 40 minutes. When the rattan dries out, it will shrink, securing the seat in place. Hold the rattan cane in a loop, large enough to circle the seat of the chair, and cut to length with scissors. The cane is used to hold the rattan sheet in place on the chair. Pry out the damaged rattan chair seat using pliers to remove the rattan cane insert, then pull the rest of the rattan out by hand. The rattan may have been glued in place, and bits of old rattan will be left in the fixing groove. Clean out the fixing groove by running the drill backwards and forwards along it. Do not apply excessive pressure since you only want to remove leftover rattan and old glue. Rub down the seat frame with sandpaper, making sure to get into the fixing groove. The groove should be smooth and as clean as possible. Apply glue to the groove in the seat frame with a 1/4-inch brush. Use a dabbing motion to get plenty of glue into the groove. Stretch the new rattan sheet over the seat frame and push the rattan cane into the fixing groove with your thumbs. Make sure that the rattan is taut and the cane fits snugly all the way around the groove. Trim any excess rattan away with scissors. The rattan will shrink as it dries and create a tight-fitting seat. Use protective clothing when using power tools. "Refinish Furniture: Repair Rattan and Wicker Furniture and Accessories"
"Homes and Gardens: Can the seats of my woven cane chairs be repaired?" Richard May provides niche Web content for various clients via online forum sites and other outlets. He has technical writing experience, having written training manuals for bespoke and commercial software applications, and holds a Bachelor of Arts in journalism.